Click each title to download an authorless event kit packed with fun and creative activities, games, craft projects, signage, tips on how to promote your store’s event, and much more! Every child who wears glasses will know just how Arlo feels, and will feel better because of it. 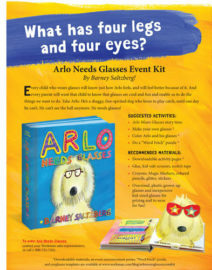 And every parent will want that child to know that glasses are cool and fun and enable us to do the things we want to do, like Arlo the shaggy, free-spirited dog! 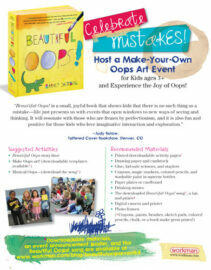 Celebrate mistakes & host a Make-Your-Own Oops Art Event! Beautiful Oops shows kids that there are no mistakes, and this event will teach kids ages 3+ to experience the joy of Oops! Host a coloring event in your store! 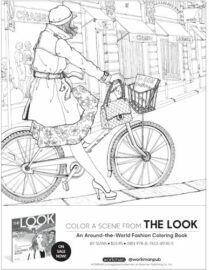 Just print out these sample pages from Workman’s five newest coloring books. Working with your hands and cultivating mindful focus are two of the best ways to soothe away stress. And coloring is a great way to do both! Summer camp is here and we’ve got your gear! Summer camp—whether it’s one-day or a week-long, is a great way to remind kids and their parents that books and reading make summer memorable. 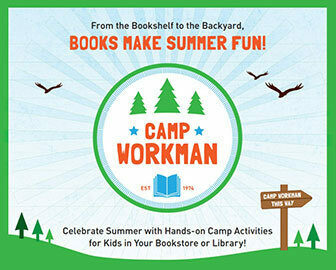 Inspired by our outstanding list of activity-filled books, here’s everything you need to host your own summer camp! 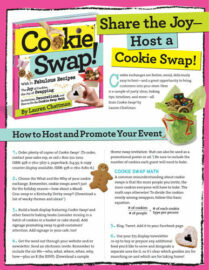 Cookie exchanges are festive, social, deliciously east to host—here is a sample of party ideas, baking tips, timelines and more—all from Cookie Swap! by Lauren Chattman. Yeeee-hah! Hang on to yer hat, cowboy! 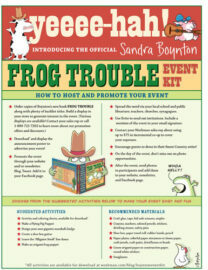 Sandra Boynton goes country withFrog Trouble, a terrific illustrated Songbook and CD, and now you can too with the Frog Trouble event kit!! 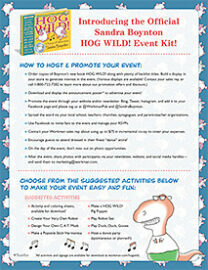 Whether you’re making pigs fly or learning the “Alligator Stroll,” this event kit has wildly fun activities for every cowboy and girl! 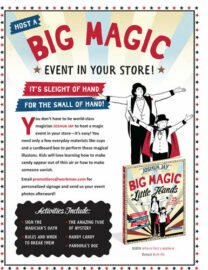 You don’t have to be world-class magician Joshua Jay to host a magic event in your store—it’s easy! You need only a few everyday materials like cups and a cardboard box to perform these magical illusions. Kids will love learning how to make candy appear out of thin air or how to make someone vanish. Host A How to Tell a Story Event in your store! HOW TO TELL A STORY is a unique set of color-coded blocks plus an interactive book that acts as a 101 course in creative storytelling. To really understand how it works, we encourage you to rip open the package, roll the blocks, and play with whomever is sitting nearby. 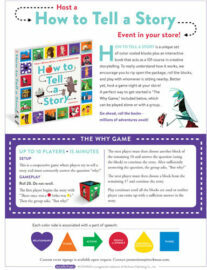 Better yet, host a game night at your store! A perfect way to get started is “The Why Game,” included below, which can be played alone or with a group. Giving your guests some background about your theme and the bottles you’ll be tasting will help inform them and shape the event. 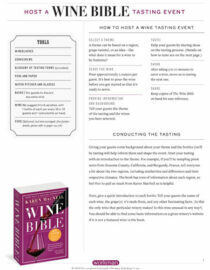 Start your tasting with an introduction to the theme. For example, if you’ll be sampling pinot noirs from Sonoma County, California, and Burgundy, France, tell everyone a bit about the two regions, including similarities and diﬀerences and their respective climates. The book has tons of information about each region, so feel free to pull as much from Karen MacNeil as is helpful. 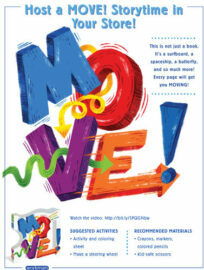 Host a MOVE! even in your store. Don’t read this book—play it! Introducing an ingenious way to help kids get the 60 minutes of active play they need each day. MOVE! is a book that combines imaginative play with movement. Hold it up to your face like a big pair of jaws and ROAR and STOMP like a dinosaur. Hold it by the die-cut handles to swing in a hip-to-hip motion while ROWING like a canoe. Or hold on tight and SPIN like a flying saucer. Math is a thrill! Especially in the gifted hands of Sean Connolly. 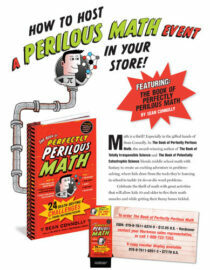 Celebrate the thrill of math with great activities that will allow kids 10 and older to flex their math muscles while getting their funny bones tickled. Origami is a fun and creative activity, and the project we've included in this kit is for paper-folders of any age and ability, but especially perfect for children ages 9 and up. 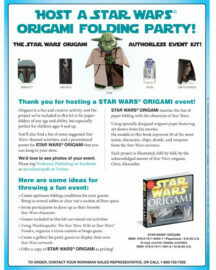 You'll also find a list of some suggested Star Wars-themed activities, and a promotional poster for STAR WARS ORIGAMI that you can hang in your store. We'd love to see photos of your event. Please tag Workman Publishing on Facebook or @workmanpub on Twitter. According to The New York Times, the #1 dream job for girls ages 8 to 12 is becoming a fashion designer. These creative projects help girls learn the basics of fashion design, starting with easy-size doll dresses. 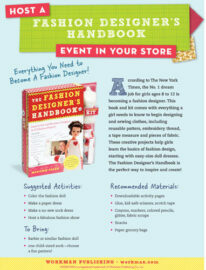 The Fashion Designer’s Handbook is the perfect way to inspire and create! TA-DAAA!!! 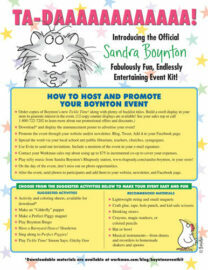 Introducing the Official Sandra Boynton Fabulously Fun, Endlessly Entertaining Event Kit! Activities and materials included! It’s the “I’m bored!” indoor activity days. And it’s time to encourage kids to get their hands on science. 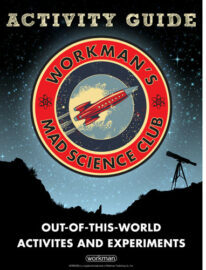 Drawn from Workman’s outstanding list of science and science-based activity books, here’s everything you need to host a Mad Science Club.